RUTLAND TOWN—Vermont has dozens of explored ancient sites that date as far back as 10,000-13,000 years and feature cookfires, refuse dumps, implements and workshops, points, pottery, charcoal and bones, shells, petroglyphs and even burials. Many more lie undisturbed beneath the surface on glacial plateaus, high in the mountains or alongside lowland creeks and marshes. Most have been discovered as a result of development: foundations, highways, power lines and substations, and now, renewable energy utilities. The proposed Otter Creek Solar Project on Cold River Road in Rutland Town is “partway through the process” of applying to the Vermont Public Service Board for a certificate of public good, which began in August 2016, according to Brad Wilson, project developer for Ecos Energy, LLC. Ecos is owned by Allco Renewable Energy Company of Australia, which is owned in turn by Allco Financial Group. The majority of its projects are in California and the Midwest. The company closed on the 56-acre parcel in Rutland Town October 2014. One hoop Ecos must jump through is providing a report to the Public Service Board laying out “the full limits of physical disturbance due to the construction and operation of the facility and related infrastructure, including areas disturbed due to the creation or modification of access roads and utility lines and the clearing or management of vegetation,” according to Act 248. In the case of ancient sites, Vermont’s landmark Act 250, passed in 1970 during the governorship of Republican Deane Davis, imposes a detailed set of standards on major development projects of more than 10 acres, or more than one acre if the town has no bylaws or zoning. Criterion 8 of Vermont’s Act 250 protects sites of historical importance by requiring pre-project evaluation of the site and any possible adverse effects. In 2015, the Vermont Division of Historic Preservation (VDHP) reviewed over 2,000 projects, according to the Valley Reporter, reporting on an archaeological investigation in Warren. Scott Dillon of VDHP, which is housed in the Agency of Commerce and Community Development, told The Mountain Times that a Phase I survey has been made that turned up a couple of ancient sites and that Phase II is “ongoing.” Phase I makes an initial search for possible archaeological elements; Phase II makes an evaluation of the full range of the evidence and its significance. Dillon said that the potential for archaeological sites in the landscape is assessed based on a “predictive model” and previous finds in similar locations. The long, natural terrace that underlies Cold River Road in Rutland Town is a likely spot for early human activity because it offers level terrain, gravel for toolmaking and access to water. The terrace likely formed at the end of the glacial period as deposits settled at the edge of a melting ice field, he said. Native Americans have occupied Vermont for at least 12,500 years—important sites of that age have been found in the course of VELCO’s building of its Northwest Reliability Project, a large power corridor spanning Rutland, Addison and Chittenden counties. Dillon is not worried about the potential impact of Otter Creek Solar on the ancient site. The site was found at the edge of the parcel in a planned buffer zone. He said that the developer has already moved the access road to avoid potential ancient sites and he expects that the site can remain in place. Mitigation of negative impacts would include hand clearing, with stumping occurring only in the areas to be graded. According to Wilson, that would be about five and one-half acres in an area that is not archaeologically sensitive. The depth of the supporting struts would be determined based on an investigation of the underlying rock structure, performed once the parcel has been cleared, Wilson said. Ultimately, the Public Service Board will make a determination of “no undue adverse impact” based on evidence provided by the stakeholders. Dillon defended solar projects in general from his archaeological perspective: “Some are even better than agricultural impacts,” he said. He said he finds Ecos easy to work with, and the state’s goal for renewable energy must be met, in any case, he added. 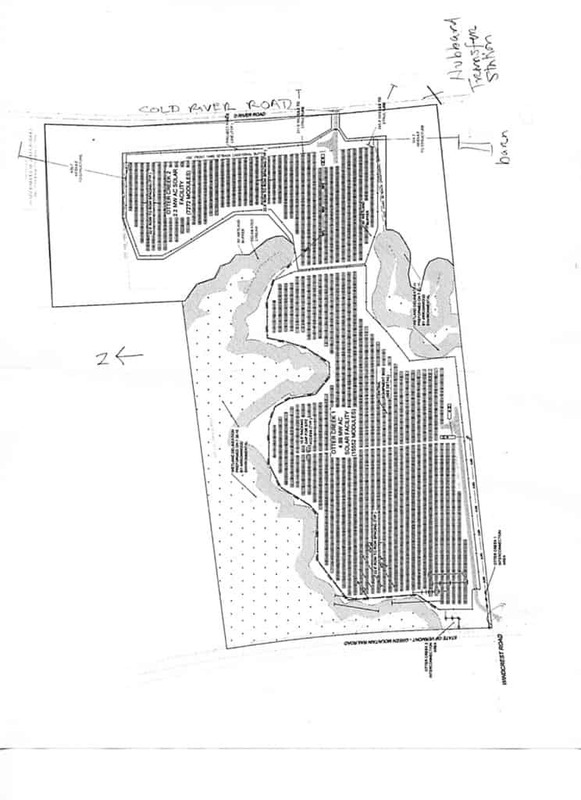 Plan of the Otter Creek Solar project. Yellow area is approximate site of historic ruins.